The story of Mahishi: Leela and her husband Madhava were both children of learned Brahmins. They were very devout and in deep love for each other. After several years of married life, Madhavan felt that it was time for them to renounce worldly pleasures and turn entirely to spiritual ways. Leela did not agree to the proposal. She won't let him do so too. The dispute led to a hot arguement. Finally Madhava cursed her to become a she buffelo with devilish disposal. Leela was reborn as Mahishi, the sister of Mahishasura. Both the sister and brother underwent severe penance and obtained boons from Brahma the Creator. As per the boons obtained, Mahishi could only be killed by a son born to Lord Shiva and Lord Vishnu. Since this was an impossible prospect Mahishi deemed herself to be indestructile and became very proud, agressive and arrogant. She unleashed terror in all three worlds. The killing of Mahishasura by Durgadevi fanned the flames of arrogance. Mahishi became unstoppable. The gods under the leadership of Indra left Amarapuri not able to stop her. The rude and crude subjects of Mahishi devastated heaven. On the earth all sacred rituals came to a grinding halt, as Mahishi would not allow any such thing. Learning and prayer became unheard of. The weight of crimes became unbearable for Mother Earth. She appealed pitiously to the Lords for redumption. They consoled her and promised proper action. Though confident in the Lords' abilities all wondered how a son will be born to two males. What they did not understand was that "Adwaitha Brahma" was beyond such sectarial considerations. Vishnumaya: Earlier, ages before, on two occassions Lord Vishnu had taken the form of Mohini (Enchantress). The first was during "Amrithamanthana". Through the combined effort of all living beings the Sea of Milk was churned. This was necessiated by the urgent need of obtaining Amrith(Devine Nectar) to cure the gods of aging, forced on them by a curse from the irrepressible sage Durvasa. After prolonged hard work recovery of many precious items, when Amruth separated, the Asuras took it away. Lord Vishnu set off to recover it from them. For this purpose the Lord transformed himself into a maiden of dazzling beauty. She appeared before the Asuras who were having a fight among them over the possession of the devine nectar. Dumbfounded by her beauty, the Asuras agreed to her proposals and sat in a row with closed eyes, waiting to be served. Meanwhile Mohini escaped stealthly with Amrith. The second occassion when Lord Vishnu took the form of Mohini was with the urgent purpose of saving Lord Shiva from Bhasmasura. Shoorpaka, an Asura performed sustained pennance and pleased Lord Shiva. The boon sought by him was that anybody whose head he touches should be reduced instantly to ashes. The boon was granted. The naive fellow wanted to put the boon to test immediately on his benefactor himself. The Lord had to take to his heels. Lord Vishnu seeing Shiva's plight decided to take proper action. He transformed himself into the form of Mohini and appeared before Shoorpaka who was chasing the Lord. No need to say that his progress was arrested by what he saw. Temporarily his priorities changed. He wanted to have this beauty. Mohini agreed on one condition. If he wanted her, he would have to dance like her. After a considerably long session of duet, Mohini slipped in a sequence which ended with her finger touching her own head. Deeply absorbed in Mohini's charm and the delights of dancing, Shoorpaka had forgotten all about the boon and touched his own head. He was reduced to ashes. When Mother Earth and the gods requested for help against Mahishi, Lord Shiva remembered Vishnu Maya Mohini. Instantly Mohini appeared before Him. Her beauty was irressistaible even for the Lord. Their union resulted in the birth of a handsome child. He came to be known as Shastha. (Some texts mention the name Karthik Swami - not to be confused with Karthikeya). Manikandha: Hariharasutha (The child born to Vishnu and Shiva) was obviously very handsome and with auspicious features. Mohini disappeared immediately, leaving the child to Shiva. He put an ornament with a beautiful jewel round the child's neck. Aware of the purpose of the child's incarnation Mahadeva placed him on the banks of river Pampa. At about the same time the king of Pandalam, an erstwhile princely state, reached the place. He was on a hunting expedition and was separated from his retinue and was wandering in the woods. He was attracted by the child's voice. He rushed to where the child was lying. Finding a child left alone in the wilderness, far from the nearest human habitats, he decided that it was a God's gift to him. For he was childless, and had only one prayer to God, throughout his waking hours, "Lord bless me with a child!" A sage suddenly appeared at the place and advised the king to take the child to the palace and rear him as his own. The king was delighted. So was the queen and the subjects. The king named the child Manikantha, inspired by the beautiful jewel he wore. Manikantha's arrival proved to be very auspicious for the royal house. The queen soon presented the king with a child, their own flesh and blood. However, the initial affection they had for Manikantha was not diminished. He grew up as their "First Born." Manikantha was bestowed with all noble qualities one could wish for. He mastered all knowledge quickly. He became a master in martial arts too. In short, he was the unchallenged heir for the throne. He started taking interest in the state's affairs and was eminently successful. When miscreants led by a muscleman named Babar (Vavar) created trouble in some parts of the state, Manikanthan was commissioned to end it. He not only defeated the opponent, but also won him over with love. An everlasting friendship started between the two. Thereafter Babar became Manikanthan's right hand in all his expeditions. Jealousy has no discretion. It creeps in wherever good things prosper. Some of the courtiers grew jealous of the smart prince. They started spreading concocted stories to frame Manikanthan. However, the love and faith of the king in him was unfailing. Soon the miscreants had an opportunity. The queen had a severe pain in the stomach, which none of the court's physicians could cure. The miscreants sent a man disguised as learned physician, who declared, "This can be cured only with the milk of *tigress." The king was worried as to who will milk a tigress. One of the courtiers suggested, "There is nothing that prince Manikanthan cannot do." The king would not agree. But the prince insisted that he would go. He loved the queen so much that he would risk even his life for her sake. While the king and many well wishers pleaded pitiously, Manikanthan set off into the forest. In fact, fetching tigress' milk was just an excuse. He was prompted by the gods that it was time for him to attend to the purpose of his incarnation, namely, destroying Mahishi. As soon as Manikanthan was alone, the gods joined him as warriers. They soon set out for heaven to fight the fierce opponent who was occupying Indra's throne. After a fierce battle, faught cosmically, Mahishi was killed. Her body fell at a place on the banks of river Azhutha. #The demon warriers sent by Lord Shiva to assist Manikantha covered the body with stones and pebbles from the river bed. The soul of Mahishi trapped in the body of Mahishi was released. She instantly fell in love with her saviour and requested for reciprocation. But, Manikanthan had decided to be a Brahmachari. To console her he said, "Soon I will be settled at one shrine. I will give you a place near me. If and only if, no $first timer visits me during a whole year, I will accept you." 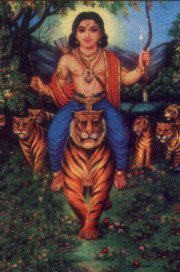 Soon a tigress with cubs, believed to be Indra himself in disguise, appeared before Manikanthan. He mounted the tigress' back and returned home. Two tigers joined them, on either flank. The cubs follwed. When the procession reached the capital, people fled in fear. The purpose over, Manikanthan let off the tigers into the forest. Manikanthan declared, "It is time for me to leave the palace. But I will not leave you altogether. Make a shrine for me close to Shabari's Ashram Send the construction party to the locality. Let them search for this arrow of mine. The exact place shall be indicated by this arrow." Thus the famous shrine came into being. At various occassions, Manikanthan had promised few others to be honoured by proximity to his shrine. They were also installed with due ceremony. These include, Ganapathi, Nagaraja, Vavar, Kadutha and of course, Leela who came to be known as Malikappurathamma. 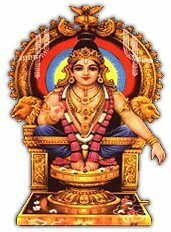 Ayyappa: There are numerous legends behind the famous shrine. One of them is supported by historical facts too. This reveals how the deity is called Ayyappa. According to this story, Ayyan Pillai was a trusted warrier of king of Panthalam. His heroic deeds were almost super human. King Pandian of the neighbouring state Madurai had once attacked Pandalam and captured a large territory including Sabarimala. Ayyan Pillai was commissioned to fight with Pandian and recapture the territory. A shrewd general, Ayyan launched a guerilla war against Pandian forces. The preparation took 41 days. All members of the troupe were required to observe strict Brahmacharya during as required by ancient martial arts. They carried warm blankets and enough provisions to last several days in the forest and wore dark coloured cloth. The expedition was a big success and Ayyan became a super hero, nay a demi god. He was considered an incarnation of Dharmasastha himself. The king dedicated the entire recaptured territory to Ayyan. After Ayyan's demise a shrine came up in the place. In spite of it being inside thick forest, annual visit to the shrine became regular, the number of visitors increased every year. With the launching of the nearby Paumpa-Kakki irrigation project, roads were constructed upto the banks of river Pumpa in the early sixties. This reduced the foot-track to just over five kilometers and there was a phenomenal increase in the number of visitors to the shrine. The latest assessment indicates close to 50 lakh visitors annually. It is believed that Sabarimala receives the largest annual collection people on a single day (Makarasankrant), Mecca during Haj being a close second. * In Malayalam texts instead of tigress, "Puli" meaning leopard is mentioned. In tamil and old Malayalam both tiger and leopard were called "Puli". Tiger is called Varayan Puli (striped ) and leopard is called Pullipuli (spotted). # A ritual in memory of this burial is still in vogue among those who go to Sabarimala on foot from Erumeli. Every first time visitor is required to pick up a pebble from Azhutha and carry it to Kallidumkunnu.